The combination of being a busy mom driving my kids around with visiting clients and going to press events in San Francisco mean that I spend lots of time driving in my car. When I drive across town with all of the traffic in Silicon Valley it can sometimes take as long as it does to drive to San Francisco (one hour)! With traffic it can be even a much longer commute (2 hours or more). Additional traffic challenges can happen due to holiday traffic, like the rush to head to the beach, parks or vacation areas this weekend for July 4th. The map apps on my phone don’t always work and at times have caused me major traffic issues. 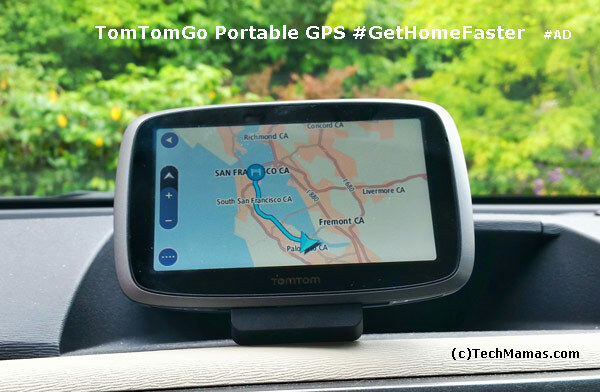 When TomTom (innovators in navigation technology) contacted me to about the new TomTom GO 500 Portable Vehicle GPS, I was excited to not only give it a try but also learn more from their press information. 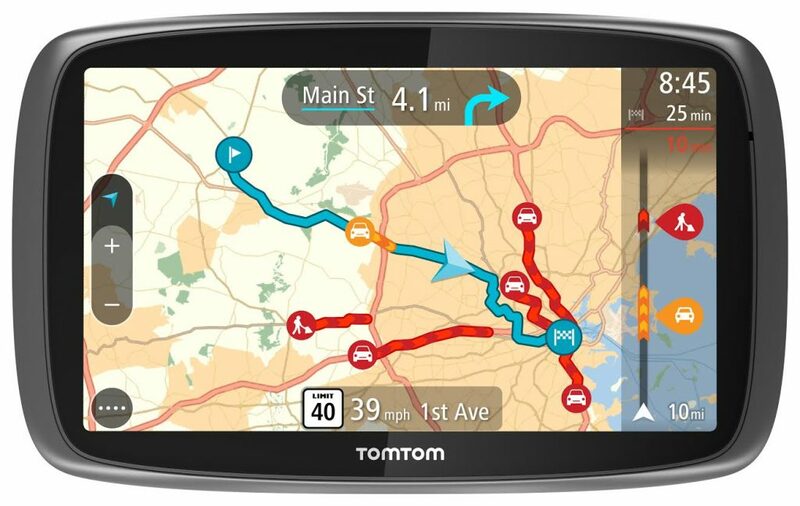 “TomTom GO Portable Vehicle GPS has been redesigned with real time TomTom Traffic, alternate routes pinpoint exactly where delays start and end so you know fastest route, 3D Maps that show building, Speak & Go to control device with your voice, and landmarks and interactive maps that allow you to zoom in and out to explore the map with your fingertips. TomTom has one of the world’s largest databases, covering 99.9% of the roads, with real-time traffic intelligence with the most up-to-date, accurate information on traffic anytime, anywhere so you can truly get to your destination faster. Routes can be planned ahead with the new MyDrive technology to be ready to hit the road as soon as she gets in the car. The TomTom Go is the only navigation device which allows you to start navigating in two taps and has “Jam Ahead” warning for traffic incidents”. 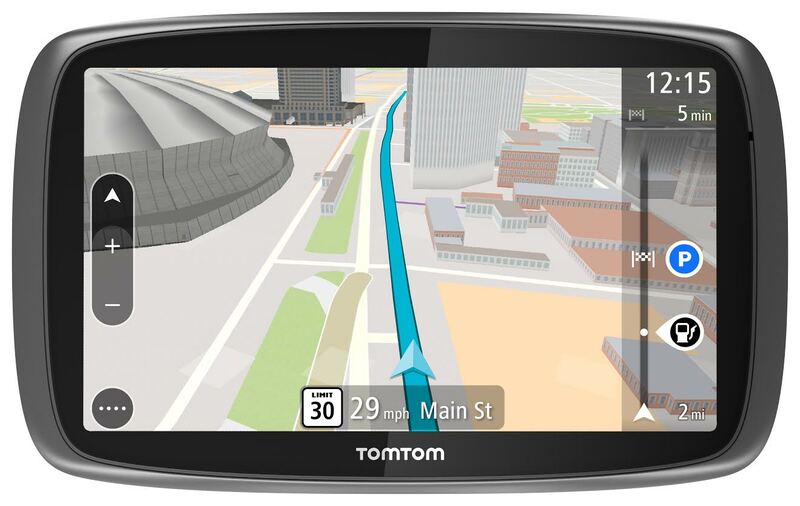 The TomTom GO 500 has GPS receiver chips that looks for satellites in the air. Once it finds 4 satellites it triangulates the location. The TomTom comes with preloaded maps that has details such as speed limits etc and Route IQ that incorporates historical data. If you are driving in an area that does not have cellular service, TomTom can still give you directions because it uses satellite information and the downloaded maps that are updated 4 times a year. All of the GO products include lifetime map updates. The downloaded maps, combined with the real time map updates from the TomTom MyDrive app, provide fully accurate traffic information. The MyDrive app is available on iOS and Android. Speak & Go to control device with sound of your voice. In the box with either the TomTom GO 500 or 600 is click & go mount, adhesive disk, car charger, USB cable for computer and quick start guide. The screen has a Route Bar on both sides which shows lots of information in one place. The Route Bar shows estimated time of arrival, distance to destination, delay in current route, upcoming speed limits, road work, speed camera alert, traffic on route and speed and distance to next event. The screen also shows parking with “P” icon. When in San Francisco and busy areas, showing parking on the map is essential for finding parking near destinations. There are even notifications about speed limits and when you are going over them. There is a free TomTom GO MyDrive mobile app – connects to smartphone via bluetooth. Note: your smartphone must be compatible, and include a data plan. Extra costs may apply. For more information, visit TomTom.com/Connect. When you first turn on the device it will ask you if you want to set up MyDrive. To do that you plug the TomTom GO it into your computer. MyDrive checks server then downloads maps through Internet to PC and then to device. When you get into your car the first time (before you start driving), just turn on Bluetooth on your smartphone (set to discoverability). Then log into the MyDrive app with the same credentials you use for online. From your computer you can type address on MyDrive and it will send to your device which connects to phone and syncs up to cloud platform. The cloud sync also takes all favorite addresses and backs them up. If you had to reset device you have favorites online. The 500/600 has microphone and voice control (Speak & Go). You can speak an address (such as “Go Home” and even set your own wakeup word out of the box (Hello Tom Tom, Go home”). Voice commands can also change brightness, settings and wakeup words. The voice prompts provides audio reminders when close to exiting such as “exit in 2 miles, get in right lane”. If you have multiple turns in a row the voice prompt will keep speaking to you “say right” “stay left” – both visually and audio. Backroads are different – it depends on class on the road. Another key feature is that you can use your phone and still get voice navigation. If you have a conference call then you won’t need to worry about navigation speaking over the call. TomTom shared information to confirm how much parents drive their kids around: “A 2013 study said that the average mom drives her children around for 1,248 miles per year, or the equivalent of two weeks “. Saving any time on the road is an important issue! How much time do you spend on the road and what would you do with the time you would have not stuck in traffic? Do you live in the any of the Top Most Congested Areas below? Sadly, I live in the second most congested city area (San Francisco Bay Area)! Share your thoughts for a chance to win a TomTom GO 500/600. To win, enter below on Rafflecopter. Contest will run from July 1, 3pm PST to July 6, 3pm PST. *Giveaway is over and winner has been notified. Check out TomTom on Facebook and TomTom on Twitter. Disclosure: Sponsored post. Products were supplied for review purposes. I spend about 8 hours on the road during the a week and with all the extra time I save not being stuck in traffic I would use it to stop and shop my favorite outlets stores. I spend about 4 hours on the road during the week and I would use that time to go to the gym! I love GPS 🙂 I use the acronym for just about EVERYTHING in my business, too! My husband has an hour and a half commute, this would be great for him. I’m sure he’d spend time with ours sons and I with the extra time.